A destroyed artifact is seen at the ancient city of Hatra, south of Mosul, Iraq, April 27, 2017. Iraqi militiamen, who drove Islamic State fighters from the ancient city of Hatra this week, found that IS had destroyed relics dating back more than 2,000 years. "The sculptures and engraved images are destroyed, but the walls and towers of the kingdom of Hatra remain standing," said Marwa Rashid, a spokeswoman for Iraq's Popular Mobilization Forces, a Shi'ite militia that is clearing IS from villages north of Mosul in northern Iraq. "There are many holes and scratches on the walls of the kingdom due to IS bullets," she said. PMF units took full control over the historic city, about 110 kilometers southwest of Mosul, after a three-week offensive. Its recapture was a part of a regional military operation known as Muhammad Prophet of God. Known historically as the ancient city where East meets West, Hatra is a UNESCO-listed World Heritage site and considered one of the archeological jewels of Iraq and capital of the first Arab kingdom. The large fortified site was founded in the 2nd or 3rd century B.C. and once was a thriving city under the influence of the Parthian Empire. A view shows the ancient city of Hatra, south of Mosul, Iraq, April 27, 2017. Its high and thick walls, reinforced by towers, helped it withstand invasions by the Romans in the years 116 and 198. Its temples offer a unique blend of Hellenistic and Roman architecture with Eastern decorative features. The site stood undisturbed for decades until April 2015, when IS invaded it. Citing Hatra's "un-Islamic" nature, IS began destroying relics on the site. In a video released by IS after its occupation, IS fighters are seen smashing sculptures with sledgehammers and destroying images and artifacts on ancient walls with assault rifles. UNESCO, the cultural heritage arm of the United Nations, called the destruction a war crime and has urged political and religious leaders in the region to take note. "The destruction and looting of the remains of the capital of the first Arab kingdom is an immense loss for the Iraqi people and the world. Its liberation marks a positive turning point and paves the way for ensuring its protection and conservation," UNESCO Director-General Irina Bokova said Thursday. PMF units said IS had planted land mines around the eastern gates of the site to deter their advances. Engineering teams will clear the site of any explosives before allowing Iraqi archeologists to assess the damage. 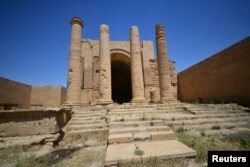 "The kingdom of Hatra will be standing high, God willing," Rashid said. 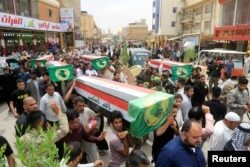 Mourners carry the coffins of fighters from Iraqi paramilitary troops who were killed in a battle against the Islamic State in the ancient city of Hatra, south of Mosul, during the funeral in Najaf, Iraq, April 27, 2017. Since mid-2014, IS has destroyed dozens of historic sites in Iraq and Syria, including mosques, churches and Shi'ite religious halls known as hussainiyas. The group says shrines and statues are "false idols" that must be destroyed. Sermed Alwan, president of the Iraqi Mesopotamian Heritage Association, said the extent of the damage nationwide to ancient sites had yet to be determined. But the initial accounting of the damage in Hatra is heartbreaking, he said. "The loss of Hatra relics is huge for Iraq and for the international community," he said.